The Gloucestershire Old Spots has made various advances overseas but until recently, has never created a viable, pedigree population outside the UK. Before World War 1, GOS were exported to America and were used to create the Spotted Poland China breed, since renamed The National Spotted Breed, which continues to this day. In the 1920s, a breeding group went to Australia but by the mid-1930s they had died out there. In the 1950s, another group went to the US and this time were used to create the Minnesota No.2 hybrid, one of the pioneers of the modern commercial hybrids that produce most pork and bacon in the western world today. 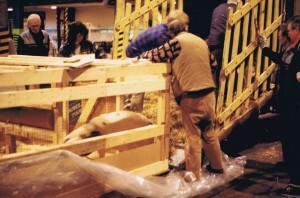 Another breeding group were exported to America in the 1980s by George Styles in the hope of establishing a reserve population outside the UK but by the early 1990s, only one ranch in California could be found to still have them and they were unregistered and thus had lost their pedigree status. In the 1980s, a small group went to the Falkland Islands to help restock them after the 1982 Falklands War but again they were not kept pure. 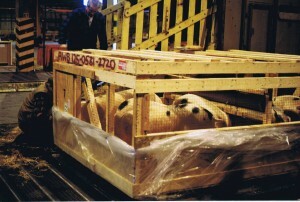 Other animals were exported to different countries as diverse as Sweden and Nigeria, France and Cyprus. But the end result was always the same. The only pedigree population remained in the UK with a small handful in the Republic of Ireland. In the event of a major disaster like Foot & Mouth disease, the entire breed could be threatened with extinction. In 1995, an American lady, Robyn Metcalfe, approached the Club asking for help to put together a breeding group to go to the States. For some reason this seemed more viable than many such enquiries received and she visited England and some of the larger herds. The upshot was that she instructed the Club to find her 20 unrelated, quality young pigs and to arrange the necessary procedures to facilitate export. 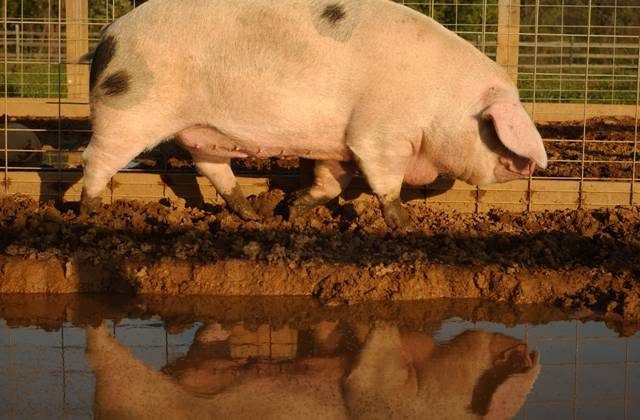 The Club’s then Chairman, Geoffrey Cloke, and Secretary, Richard Lutwyche, visited three significant herds to select stock and get agreement to isolate the selected pigs while veterinary tests were carried out. The three herds were George Styles’ Horsehill herd in Worcestershire; Jonathan Crump’s Burfords herd in Gloucestershire and Arthur and Ann Uglow’s Endsleigh herd in Devon. A livestock export consultant, Tim Harris, joined the team to co-ordinate activities, ensure the extensive paperwork was completed in time and accurately and to book the flight and make the necessary arrangements for their arrival in New York. Pig Breeders celebrate at heathrow l-r Jonathan and Mel Crump, Tim Harris, a representative from GOSA, Arthur Uglow, Gordon, George Styles’ stockman and Neil Styles and David and Ann Uglow. 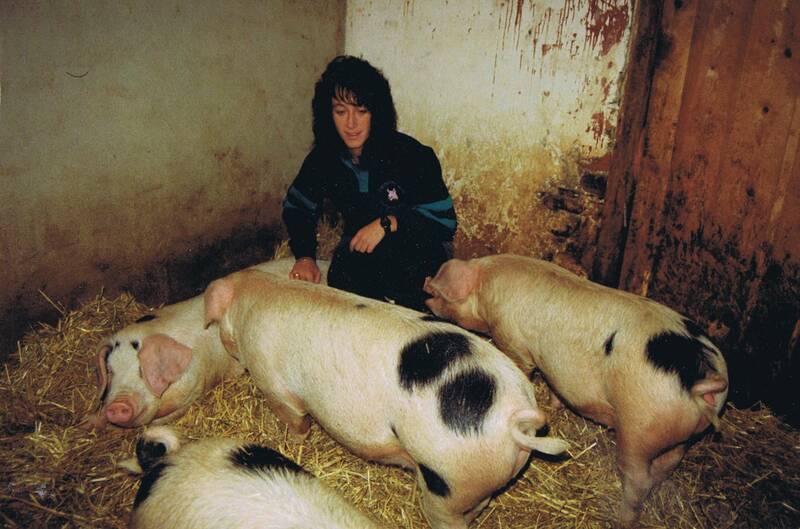 The chosen pigs were moved into isolation for several months and tended by stockmen who had no contact with the other pigs on the farm while extensive veterinary tests were carried out. 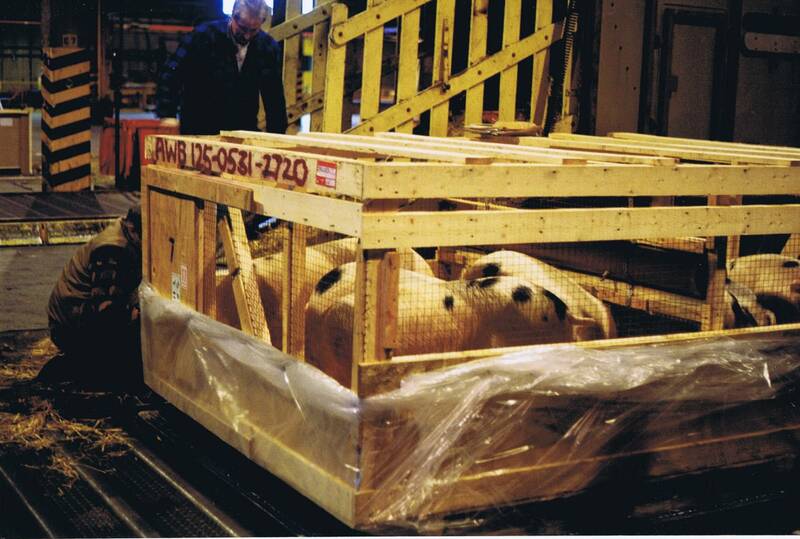 Eventually, all the legal hurdles were cleared and special crates built and the three lots of pigs came together for the first time at Heathrow Airport on a cold winter’s morning where they were loaded into the crates and then onto the jumbo jet. Ann Uglow tends to her pigs in the isolation unit on her farm in Devon. Loading the pigs into their special crates at Heathrow. Sadly for them that wasn’t the end of their ordeal for they were moved into another isolation unit in New York while further veterinary tests were undertaken and whilst the pigs that were first selected on those three English farms were only a matter of weeks old, when Robyn Metcalfe and other American farmers committed to taking these pigs first saw them, they were sleek pigs nearer a year old and ready to start breeding. Final preparations before the pigs are transferred on board their jumbo jet. The plastic sheeting is to ensure that none of their urine or faeces escapes into the hold. Robyn set up Gloucestershire Old Spots of America Inc. as the pedigree organisation there to maintian pedigree status and promote the breed. Although some bloodlines have been lost, the American population is now significant and provides a safe haven should disaster strike the British herd so that, red tape and cost notwithstanding, it should be possible to reimport pure GOS genetics to restock and save the British population.